A few years ago I did a post on film industry slang that screenwriters should be familiar with. Today I’m going to add a few more words to the list. It’s useful to know these things so you don’t sound like a newbie. Shared Universe – This is the hot new buzzword in the film business. It means a story world that encompasses multiple movies featuring different characters in interconnected stories. The term was born to describe the “Marvel Universe,” but it also applies to the “Star Wars Universe,” Sony’s upcoming “Robin Hood Universe,” and Universal’s new shared universe built around their classic monsters. Option – Used as a noun to refer to an option-purchase agreement (“I have an option on that script”), or as a verb to refer to making an option-purchase agreement (“I want to option that script”). In an option-purchase agreement, a producer or studio acquires the exclusive right to purchase a script for a specified period of time. They pay a small fee for this right. If they “exercise the option” they pay a pre-determined amount and then own the script. If they “let the option lapse” (by not “exercising the option”) the writer keeps ownership of the script as well as the fee. Pitch-Off – This refers to a situation where a producer or studio brings in multiple writers in separate meetings to pitch their take on an assignment. The producer/studio then selects the pitch they like best. Beat Sheet – An outline using bullet points or numbered beats to outline the steps of a story. Marked Script – This is a draft of the script that shows the changes from the previous draft. You generate a “marked script” by turning on Revision Mode in Final Draft before you begin making changes. Selling Script – A spec written for the purpose of selling or as a writing sample. Used to distinguish from a script being prepared for production. Selling scripts differ in that they are written to read well. Attention is given to making the wording of action and description compelling, and format rules may be fudged to ease the reading process. Scripts heading to production must adhere to much stricter format and style rules. Pre-vis – Short for pre-visualization. These are videos created using rough CG animation to visualize how a scene will be shot. Pitch-vis – Some directors have begun making pre-vis videos of sample scenes for pitches to show how they would approach a project. Writers are not expected to do this. Notes – Feedback from producers, executives, the director or stars to guide the writer on the next rewrite. Page One Rewrite – Refers to a major overhaul of a script. In theory, the writer would throw away the entire previous draft and start over from page one. Often, though, the term is used to simply mean the rewrite will require substantial changes. Water Bottle Tour – When you do a series of general meetings at various producer/studio offices. So-called because you will be given a bottle of water at each meeting. Since you will probably not finish the bottle in the meeting, you soon have a collection of water bottles in your car. Discovering a logic hole in a finished draft of your screenplay is upsetting. A great story with great characters can be completely undone by a big enough flaw in logic. At the very least, you risk taking the reader/audience out of the story. There are a variety of ways logic problems can seep into your screenplay, and a variety of ways to fix them (thankfully). But it can be challenging. Pull carelessly at the threads of logic and the whole story starts to unravel! The first approach is preventative. If you create a solid outline for your screenplay, you can catch and fix logic flaws before you commit to a complete draft. Many of the techniques I’ll discuss below will be as useful for fixing logic problems in an outline as they will in a screenplay. The difference is that it’s easier to make big changes at the outline phase. Sometimes, though, a logic problem will slip past you. You may not recognize it until you give the script to a friend for feedback. Other times a structural change in a rewrite can introduce a logic flaw that must be dealt with. Continuity errors are one type of logic flaw. They can be big or small. A small continuity error would be something like having a character draw a gun two scenes after we saw them throw their gun into the ocean. Sometimes you can just fix those by removing the later reference, but if it’s important that they draw the gun in the later scene, then you may have to add a scene where they somehow retrieve the gun from the ocean or acquire another gun. With a little brainstorming, it shouldn’t be hard to come up with a solution to smaller continuity issues. Bigger continuity errors might be something like a character appearing in a scene after they’ve been killed. These usually arise when you restructure and move scenes around. You will likely have to restructure some more, or make bigger changes. Consider giving actions to different characters or changing the scene location. Maybe you can move a plot point or piece of exposition from one scene to another. The biggest challenge is usually letting go of how you previously imagined it. Try brainstorming five other ways the broken story beat could occur – even if your five ideas are ridiculous, you will start to open your mind to other approaches. Character goal can be a powerful tool for solving logic problems. If you need something to happen in your story, but there is no reason that it would, look for a character who could make it happen and then give them a reason to act accordingly. In Some Like It Hot (story by R. Thoeren and M. Logan, screenplay by Billy Wilder and I.A.L. Diamond), there is a funny subplot where Jerry, disguised as a woman, agrees to go on a date with a millionaire named Osgood. But why would he do this? The answer is that Joe is pretending to be a millionaire to woo Sugar and convinces Jerry to accept the date so Joe can sneak on board Osgood’s yacht and act like he owns it. There are many ways Joe could have seduced Sugar, but the yacht scheme gives Jerry a reason to do something “illogical.” He wants to help his friend. Another common type of logic problem is when there’s an obvious, easier solution to the character’s problem and they don’t take it. In essence, they aren’t acting in their best interest. You can fix this by giving the character a reason not to resort to that other solution. In Little Miss Sunshine (written by Michael Arndt), the family runs through all alternative possibilities for getting Olive to the pageant other than having everyone pile in a van. In quick succession they eliminate each one. They don’t have money to fly, Sheryll can’t drive a stick, Frank’s suicidal and not to be left alone, etc. In The Godfather (screenplay by Mario Puzo and Francis Ford Coppola), Michael’s the least likely candidate to kill Sollozzo. But he’s also the only person Sollozzo is willing to meet with in person, so any other choice is no longer an option. Planting is also a powerful way to solve logic problems. First, come up with an explanation for the logic hole. Even if that explanation sounds implausible, you can often sell it by effective planting the idea in an earlier scene. In Some Like It Hot, Joe’s plan to use Osgood’s yacht may seem overly complicated. So the writers establish in an earlier scene that Sugar’s vision of the ideal man includes someone who owns a yacht. Now the whole scheme makes perfect sense. This is also an effective way to give a character a prop or piece of information they may need to close a logic hole. In Back to the Future (written by Robert Zemeckis & Bob Gale), it may be hard to believe that Marty would remember the exact date and time lightning struck the clock tower. So in an early scene, the writers have a woman hand Marty a flier for a fundraiser on the anniversary of that lightning strike. And then Marty’s girlfriend writes a number on the back of the flyer. Later in the movie, when Marty needs the information about the lightning strike for the story to make sense, voila – there it is in his pocket. When faced with a logic hole you can either find a way to eliminate it or create a reason why it is actually not a hole. To do this, character motivation and planting will be your most effective tools. When to Define the Rules… And When Not to. One of the projects I’m currently working on is a script for a graphic novel. The story involves a demon with supernatural powers. I recently showed the script to my writers group for a second round of feedback. Since the last draft, I had added a prologue that, among other things, attempted to define the demon’s powers and how they worked. I got feedback that the mythology was confusing and too complex. Ironically, I didn’t get that feedback on the first draft, which had the same mythology but didn’t try to explain it. So what had I done wrong? It’s generally accepted that you have to explain the rules of your world and any supernatural or sci-fi elements in your story. If you have a superhero movie, for example, we want to know what the superhero’s powers are. The audience needs to understand what he can and can’t do. If we don’t know that, it’s hard to understand the drama. We don’t know when the hero’s in danger. If he pulls out a brand new power to save himself from a perilous situation, it’s unsatisfying. It feels like cheating. That theory would suggest I was right to try to explain how my demon’s powers work. But I missed two crucial nuances to the principle. First, when we say we need to know the rules, we mean that we need to know what is and isn’t possible. That doesn’t mean we need a complicated explanation for how the magical thing works. I made a “Star Wars” mistake. In the original Star Wars trilogy (episodes IV, V, and VI), the force was a mystical power. We got some sense of what one could do with it – the Jedi and Sith basically had telekinetic and telepathic abilities. Nobody really questioned the logic of it. But when Lucas started his new trilogy with The Phantom Menace, there was exposition that tried to explain how the force worked. It was a confusing bit of mumbo-jumbo involving tiny microbes called midi-chlorians. And the more the movie explained the force, the more confusing and unbelievable it became. Compare that to E.T. : The Extra-Terrestrial (written by Melissa Mathison). In the movie, E.T. has three alien powers: he has a psychic link with Elliott, he can heal with a touch of his finger, and he has a small amount of telekinesis. All of these powers are established in the first act. This satisfies the principle of “defining the rules.” Since we see E.T. levitate the fruit in Act I, for example, we don’t question his ability to levitate the bicycles in Act III. What we don't need to know is how E.T.’s alien physiology allows him to do these things. The explanation is simply: he’s an alien. There’s another screenwriting principle that will help explain the second mistake I made. The principle is: coincidence that works against the main character is okay; coincidence that helps the main character is forbidden. But also because we want the hero to earn their victory, a random event that works against them is okay, because it makes that victory more difficult. In Gravity (written by Alfonso & Jonas Cuaron) almost everything that happens to thwart Ryan’s survival is coincidence, from the shuttle being destroyed to landing in a lake instead of dry ground at the end. And it certainly doesn’t feel like cheating! Supernatural or sci-fi powers are not coincidences, but I’ve realized the same concept applies. We need to know about E.T.’s ability to levitate early on because it will be used later to save the heroes. But consider a different kind of alien movie: Alien (story by Dan OBannon and Ronald Shusett, screenplay by Dan O’Bannon). In Alien, the alien’s powers are revealed slowly. That’s part of the fun – watching how the characters react to each new terrible surprise. When the heroes try to cut the face-hugger off of Kane, it’s a shock to them and us that the alien has acid for blood. And then the chest-bursting scene is shocking because we didn’t know an embryo was implanted in Kane. Next, the characters try to catch the little alien with small nets, only to discover it has grown to a huge size. The movie wouldn’t be nearly so entertaining if we were shown all those alien powers up front. The difference is that in Alien, the alien is the villain. Each new reveal of the alien’s powers puts the heroes in a worse situation. Like coincidence, it doesn’t feel like a cheat because it’s making the characters’ problems greater and therefore their ultimate victory greater. And I do think it matters that in Alien, once the creature’s power is revealed, some science-y sounding explanation is offered – the blood is a “molecular acid” for example. When people go to a movie, they make a subconscious agreement to suspend disbelief. But that suspension comes with an expectation of internal consistency. So you can introduce unusual stuff early (like in E.T.) and the audience will just accept it, but if you introduce new stuff after Act I, you need to offer some justification. And you can’t stray too far from what you’ve set up. In Alien, we learn early in the movie that this is a world where aliens exist. When the crew of the Nostromo receives the mysterious signal, they discuss whether it could be of "alien origin." And once we know that there actually is an alien, we imagine it probably has some unusual physiology, even if we don’t know what that physiology is. Compare that to The Village (written by M. Night Shyamalan) where the twist threw people out of the story because it was so radically different from the world that had been set up. So I’ve learned my lesson. I’m going back to revise my graphic novel script. I won’t try to explain the demon’s powers up front, but I’ll be sure they are of an internally consistent nature. And I’ll make sure any reveals work against my heroes. Hopefully my next draft will pass muster with my writers group! You need a good story when you pitch, of course. But you are selling more than a story. You are also selling yourself as a writer, and particularly why you are the best writer to execute this specific idea. Whether it’s an original idea or an assignment, you need to show that you have a unique insight into the story and a passion for the project. 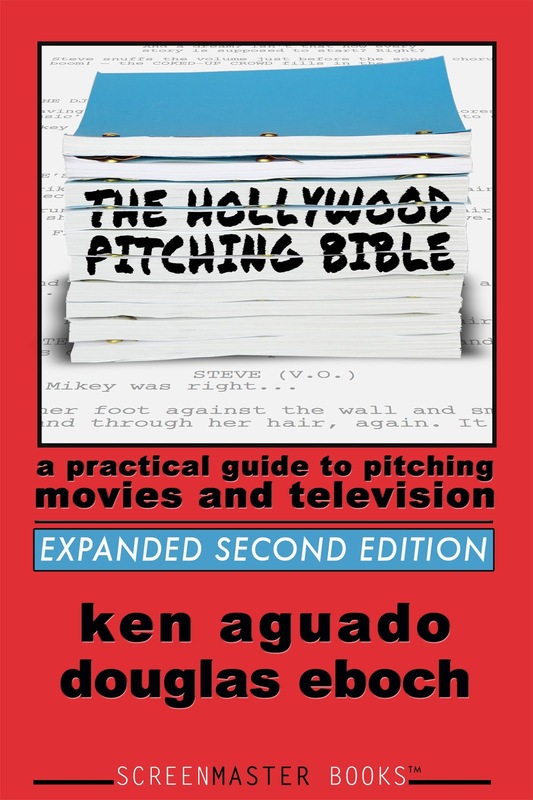 In The Hollywood Pitching Bible, which I co-wrote with producer Ken Aguado, we advocate starting your pitch with a “Personal Connection.” The personal connection serves multiple purposes, but the main one is to explain why you are the best writer to write this story. There are many ways to build a personal connection. Here are five of the most common and most effective. 1. Describe how you came up with this story. You can use a variation to this approach when pitching an assignment or when pitching a story based on some type of underlying intellectual property that you didn’t actually create. For these types of pitches, talk about what in the material particularly appeals to you. This will reveal your point of view on the story - a point of view that should carry through into your pitch. 2. Tell a personal story. There’s no better way to establish why the story you’re pitching is personal to you than telling an autobiographical story that relates to the material. This will show why you have a valuable perspective on the story or unique expertise that will help you tell it better. This is easiest to do, of course, if the story you’re pitching is actually based on your personal experience. But even if it isn’t, you might be able to identify a personal experience that relates to the idea. Just be sure the connection is clear! There are a few dangers to this approach. If you don’t really have a relevant autobiographical story, it can feel like you are reaching to make a connection. You also want to avoid sharing something that is so personal it might make the listener uncomfortable. And be sure your own experience isn’t more interesting than the story you’re pitching! But if you can find something appropriate about your life that is relevant to the story, this is often the most effective way to build a personal connection. This is an excellent technique to use when you are dealing with a true story or underlying intellectual property. Anybody could do a new version of King Arthur, for example. What special perspective on the classic story are you offering? 4. Describe the cultural relevance. This is often the best approach when you are doing a historical story because it may not be readily apparent why a modern audience will care about past events. If your story is about the third crusade, why will people today be interested in it? The same principal often applies to fantasy or science fiction. Just remember that it takes a long time to make a movie and only slightly less time to launch a television program. Be careful you’re not tying your story to a passing fad. 5. Establish the emotional core. The personal connection is a good place to establish the emotional power of your story. It is often difficult to fully convey the emotion while walking the listener through the plot (though you should certainly try!) In the personal connection, you can talk about how powerful first love is before launching into your story about high school romance, for example. This can be a good approach when dealing with genres like mysteries or action where the emotional component may be overshadowed by plot or spectacle. You’ll notice that many of these techniques can be combined. Often combining approaches is a good way to build a unique personal connection to your story. And each personal connection requires a unique approach, something specific to the story and specific to you. That’s why it’s personal! The way you introduce a character is extremely important in a screenplay. How we meet a character will be the fist thing that shapes our perceptions of them. It will color how we feel about them. It also alerts the audience as to who they should be paying attention to. Here are three techniques for bringing your major characters into your story. 1. Dramatize the character’s most critical quality. There’s a reason why Indiana Jones is introduced as the swashbuckling adventurer before we see him as the slightly bewildered college professor in Raiders of the Lost Ark (story by George Lucas and Philip Kaufman, screenplay by Lawrence Kasdan). The filmmakers want us to see Indy as heroic, resourceful, and clever. And think about how Marion is introduced in that same movie – the lone American in a bar in Tibet engaged in a drinking game with a very large man. A game she wins. We immediately learn that she is feisty and tough, perhaps an equal match for our hero. When deciding how to introduce a character, ask yourself what their most critical quality is for your story. In Whiplash (written by Damien Chazelle), we meet Andrew practicing drums alone at night, an entrance that highlights his goal in the movie, his dedication, and his solitary nature. Then Fletcher comes in and torments poor Andrew – a preview of their relationship throughout the movie. Chazelle could have chosen any number of ways to introduce Andrew – in class, at the movies, with his father. But this introduction establishes the most important aspect of his character within this story. Advertising your character before they appear will build anticipation in the audience and help define the character’s nature. A great example of this is the introduction of Hannibal Lecter in Silence of the Lambs (screenplay by Ted Tally). In the ten minutes or so leading up to his entrance, all we hear is how dangerous Lecter is and the safety procedures that must be used in dealing with him. That’s matched by the visuals as we see Clarice led ever deeper in the psychiatric prison until she’s brought to a dungeon like hallway. When Lecter is finally revealed, standing primly in a neat cell, and greets her politely, we’re already terrified of him. His good manners come off as creepy! The movie Notorious (written by Ben Hecht) introduces Alicia coming out of her father’s trial. But before she appears, the reporters in the hall talk about her. Then someone shouts “here she comes” just before she steps through the doorway. Her importance is emphasized by the reporters surrounding her, taking pictures and asking questions, and the cops keeping an eye on her from the corner – even though she doesn’t say a word. Like Alicia stepping through the courtroom door, you can give your character a dramatic physical entrance to show us how important they are. Whiplash gives Fletcher an entrance by having Andrew reacts to someone off screen. We cut to a figure standing in the shadows. He then steps forward into the light. It’s a simple but effective way to focus attention on the character. The Godfather (screenplay by Mario Puzo and Francis Ford Coppola) gives Don Corleone an entrance with a surprisingly common technique: not showing the character's face until deep into their introduction scene, building curiosity in the audience. The first scene of the movie opens on a minor character, apparently talking to the camera and making a speech about America. But we come to realize he’s talking to an unseen individual whom he’s appealing to for justice – justice he couldn’t get from the cops. The first thing we actually see of Don Corleone is his hand gesturing. And that gesture causes a shot of booze to appear out of nowhere for the on-camera character. The unseen Don seems to have almost God-like powers. This all serves to advertise the character. And then after we’ve become intrigued by this obviously important person, the camera finally cuts around to show us his face. Raiders of the Lost Ark introduces Indiana Jones in a similar fashion. We only see the mysterious man-in-the-hat from the back as he leads his small band through the jungle. It’s not until one of his men draws a gun and prepares to shoot him that Indy’s whip cracks out, disarming the man, and Indy turns, steps into a beam of sunlight and reveals his face. The characters are the audiences’ way into the story. We don’t care what happens if we don’t care about the characters. Use these techniques to start that relationship between audience and character from the character’s first appearance on screen. A note to my readers: I have typically been posting on this blog on Thursdays or Fridays. But because of recent schedule changes in my life, it will be easier for me to post on Mondays for the foreseeable future. I will start this transition by posting on Wednesday next week (11/11) and then Monday of the following week (11/16).